On Kat’s sixteenth birthday her whole world turns upside down. On that very day strange things begin to happen to her. At first she thinks she has something wrong with her eyes or that maybe she is going mad because she starts to see unusual things – strange creatures out of the corners of her eyes, but when she turns her head there is nothing there! Kat is about to have to accept that everything may not be as it appears, and she will make some amazing discoveries that will change her life forever, there will be no going back, she must complete the quest. Kat Brown must find the enchanted maps that are projected from the most beautiful, transparent, wings; she must find them all before it is too late! Kat’s best friend, Sam, helps Kat alongside her on her journey as they meet new people from a secret magical, order called the Elcaro. It is a journey of discoveries in every way imaginable. As friendships are forged and love stories begin between the friends, their quest becomes as much a journey of self discovery as it does the biggest adventure of all their lives! I found Sam (best friend of the main character) interesting. She is determined to get what she wants but she does it in a manipulative way so that she doesn’t come across as being nasty. An example of this is when she started dating Kat Brown’s crush and then insists that she didn’t know that Kat liked him. Even though she can be manipulative, she has a soft spot for Kat’s family because they treat her like she is worth something special. I like how Kat self internalises. A quote from the book, “Obviously, I was still new to the concept of beautiful things being evil.” I like this part as we are told during childhood that bad things in the world, especially in children’s stories, are generally ugly and frightening whereas all the good things are admirable or beautiful. This shows just how many stereotypes there are in this world that should be challenged. What I didn’t like about the book was how everything was so predictable. Everything just worked out too easily and was too cliché e.g. Kat Brown had two guys in her life; she kissed one of them but he didn’t feel the same way about her so she just moved onto the next guy. The plot was so simple and the language techniques were basic. Angels, Demons and Kat Brown by Anita Austin is simple and perhaps best fitted for those ages 9 to 12, who would find it more enjoyable. 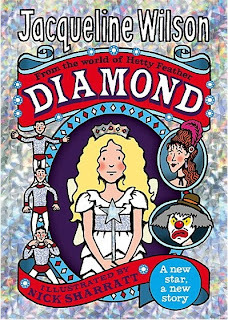 Diamond, by Jacqueline Wilson, is the fourth book in the Hetty Feather series. Ellen-Jane has a bad start to her life, with naughty brothers. When her mum dies and she has to perform on the street to earn her living, her father agrees to sell her to a strange man. She begins a new life as an acrobatic circus girl, Diamond. Diamond is told in the eyes of Ellen-Jane Potts, who changed her name to Diamond to fit in with the circus she is forced to join. The main characters are Diamond, Hetty Feather, Beppo The Clown, The Silver Boys, and Madame Adeline. With heartbreak, danger, bravery, and friendship it is a treat for all. This is a superb book. Jacqueline Wilson describes scenes and characters as well as always, which makes it seem like you are actually there. ‘I was crying now as I ran around calling – and then I heard a wailing high above me. I looked up, the rain hitting my face, almost blinding me, but when the lightning flashed I saw a tiny creature darting about at the top of a very tall, thin tree, horribly buffeted by the wind and the rain.’ Jacqueline’s voice stands out in this book and I think people won’t be disappointed. I think this book is one to put on your must-read list and is a gem, just like Diamond. Kids reviewing books for kids! How do you know that a book is good for your child? Sometimes adults do read children's books and they can determine what is good or not. However, sometimes we don't like a book but the kids love it? Why? I don't know...I'm not a kid. So hopefully soon, there will be many reviews of books here by kids. Wait and see.